How Will the New Tax Law Affect Business Owners in 2018? The new tax law, unofficially entitled The Tax Cuts and Jobs Act has finally been passed. Most provisions will take affect beginning January 1, 2018. It does not affect 2017. 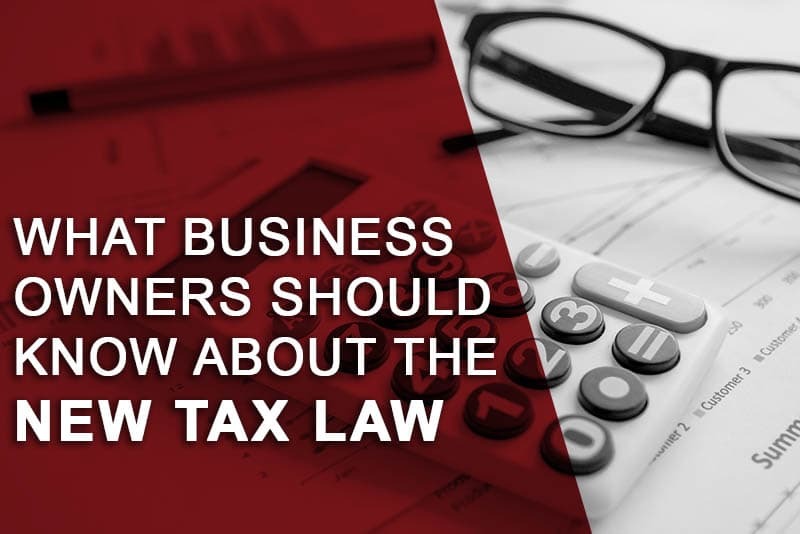 As with any new tax law, there will be a lot confusion as to how your business and, in many cases, how you as an individual may be affected. Jump to: How Will It Affect My Business? 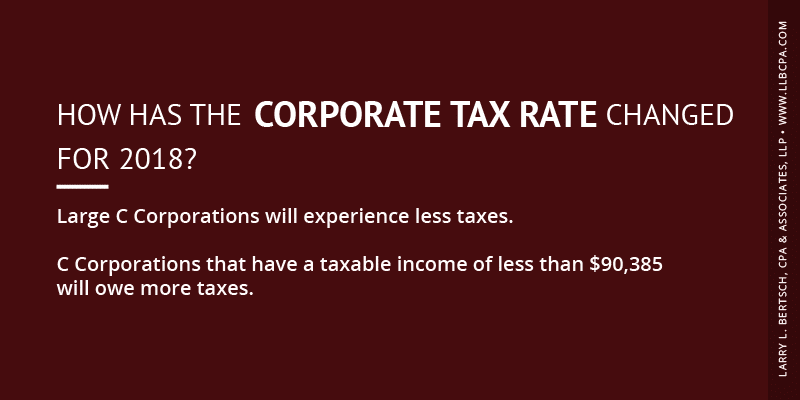 What Are the Corporate Tax Rate Changes? Jump to: How Will It Affect Me as an Individual? What Are the New Tax Rates for Individuals in 2018? How Is the Standard Deduction Changing? Many business owners have both individual and business tax concerns, so reading both sections may be of benefit. How Does the New Tax Law Affect My Small Business? The new tax law affects individuals, C Corporations and businesses that operate on a pass through basis (Sole-Proprietorships, Partnerships, S Corporations and LLC’s) in different ways. In this article we examine the effects on business taxpayers. If you need help with Nevada business tax filing, we can help. The new tax bill provides potential tax reduction for most business taxpayers, especially large corporations, beginning in 2018. There is no change for 2017. It is not, however, true tax reform or simplification, although there can be some simplification for some taxpayers. The Internal Revenue Code spells out the rules that the government follows to collect the money it needs to pay its obligations. It is also a political tool. This bill is almost 1100 pages long, yet it does little to change the fundamental structure of the tax code or simplify it. In fact, many of the changes affecting individuals were put in place to offset projected lost revenue to the government due to significant decreases in the tax on some corporations also included in the bill. A better term, then, might be tax tinkering. Who Are the “Winners” and “Losers”? Unfortunately, there is a lot of hype that surrounds a new law such as this and there is always demand to know who wins and who loses. This is almost always driven by the agenda of the person or persons asking the question. However, for the business taxpayer, the only consideration should be how the law affects the business given its unique situation, especially if the business is a pass through entity mentioned above. In this article, we attempt to cover the basics so that businesses can plan accordingly. As with any financial, business, or tax situation, the taxpayer should evaluate all aspects of any transactions they either are already involved in or are thinking about and, if necessary, consult a competent professional such as a Certified Public Accountant or an Enrolled Agent. Proper tax planning doesn’t take into account how it affects someone else. The goal is for the taxpayer to come out as the winner. How Has the Corporate Tax Rate Changed for 2018? Perhaps the most significant change in the new law relates to the corporate tax rate. Regular, or C Corporations, are taxed at different rates than individuals and all other forms of businesses that are pass through entities where the income of the business is taxed at individual rates. The new law replaces a series of tax brackets for C Corporations with a permanent flat 21% tax rate for all taxable income of the C Corporation. This will result in less taxes for any C Corporation that has taxable income of more than $90,385, based on 2017 corporate tax rates, beginning in 2018. Above that figure, the corporation is getting a tax break, below that figure it would owe more taxes. This will have a significant effect on very large C Corporations, which is the intent of the new law, by freeing up more profit to be invested as the corporation sees fit. What If My Business Is Not a C Corporation? Most small and medium-sized businesses are not C Corporations, and the new corporate tax rates do not affect them. Rather, they are pass through entities where, as was mentioned above, the profit or loss of the business is taxed on the owner(s) individual tax return. The new tax law outlines separate rules for the taxation of these types of businesses. How Are Pass Through Entities Taxed in the New Tax Law? In general, the new tax law allows owners of Sole-Proprietorships, Partnerships, S Corporations, and LLCs to deduct, on their individual tax returns, 20% of qualified income from the entity. For example, a sole-proprietor whose business had qualified income of $50,000 would get a deduction on their personal tax return of $10,000 in determining their taxable income which, again, would then be taxed at their individual tax rate. This is a very simple example. In reality, there are a number of definitions, thresholds, and limitations that apply to this deduction which may serve to make it a very complicated calculation at best. If you have an ownership interest in any of these types of entities, you should proactively consult a competent tax professional such as a Certified Public Accountant or Enrolled Agent to see how the provisions apply to your business and the effect it will have on your individual tax situation. What Other Changes in the New Tax Law Affect My Business? The only other rather significant change affecting businesses under the new tax law relates to the deduction for depreciation of business assets. Businesses are allowed to accelerate the amount of depreciation they can take on the purchase of new property and equipment through bonus depreciation and Section 179 expensing. In general, Section 179 allows a business to write-off up to $500,000 of the cost of new and used property and equipment in the year of acquisition used in a trade or business (not including rental property) with certain restrictions. The new tax law increases this amount to $1,000,000. Bonus depreciation, under the old law, applied only to new property and equipment and, in general, allowed an additional 50% deduction after taking a Section 179 deduction. The new law increases this amount to 100% and extends it to used property as well. The limitations on depreciation of passenger vehicles used in a trade or business is increased under the new law. There are several other changes to the taxation of businesses that are fairly specific and which do not affect most small businesses and are, therefore, beyond the scope of this article. By now it should be clear that if you own a business, the new tax law will have an effect. The discussion here has been very generic. Again, the new tax law is almost 1100 pages long and will affect both businesses and individuals alike. If you own a small business, especially if it is a Sole-Proprietorship, Partnership, S Corporation, or LLC, this is especially true. In general, the new tax law is designed to help small businesses so it is very important that you seek the help of a competent tax professional such as a Certified Public Accountant or Enrolled Agent to make sure you are maximizing all these benefits and legally minimizing your company’s tax liability. How Does the New Tax Law Affect Me as an Individual? The new tax law, unofficially entitled The Tax Cuts and Jobs Act, has finally been passed. Most provisions will take affect beginning January 1, 2018. It does not affect 2017. As with any new tax law, there will be a lot confusion as to how you may be affected. Almost all provisions of the new law are temporary, beginning at the start of 2018 and expiring at the end of 2025. Unfortunately, there is a lot of hype that surrounds a new law such as this and there is always demand to know who wins and who loses. This is almost always driven by the agenda of the person or persons asking the question. However, for the individual taxpayer, the only consideration should be how the law affects them personally given their unique situation. In this article, we attempt to cover the basics so that an individual can think about how that is the case. As with any financial, business, or tax situation, the taxpayer should evaluate all aspects of any transactions they either are already involved in or are thinking about and, if necessary, consult a competent professional such as a Certified Public Accountant (CPA) or an Enrolled Agent (EA). Proper tax planning doesn’t take into account how it affects someone else. The goal is for the taxpayer to come out as the winner. Tax rates have gone down, and the amount that is subject to each specific rate has increased. This is a tax reduction. There are still seven individual tax brackets. The Internal Revenue Service (IRS) publishes tax tables and tax rate schedules each year, taking into account changes in the cost of living. You can view the tables here to determine your specific tax rate and bracket. 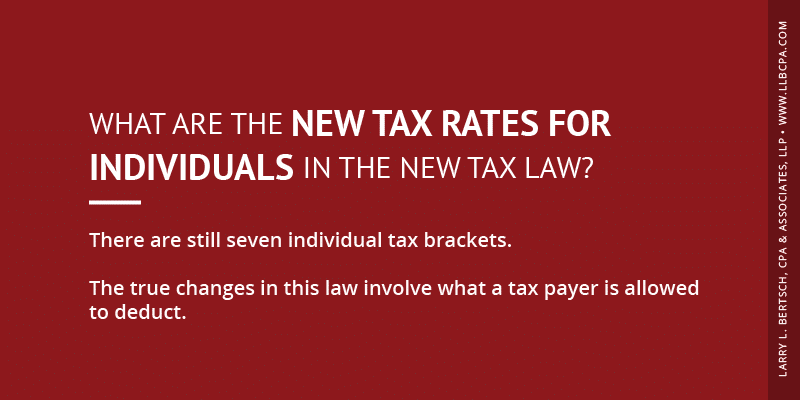 While reducing tax rates is significant, the true changes in this law involve what a taxpayer is allowed to deduct to determine the amount to which these rates will apply. The concept of simplifying the country’s tax system is talked about quite often. It is, in theory, a major factor in introducing and passing this new law. True tax simplification and reform, as we have already mentioned, would significantly reduce the size and scope of the Internal Revenue Code and eliminate many of the tax forms and schedules that must be filed. This law does not do this. It does attempt, to a limited degree, to simplify the process for filing a tax return. The thinking is that the less paperwork a taxpayer fills out, the easier it will be to file a tax return. Probably true. However, this law really only seeks to reduce the number of taxpayers who prepare a Schedule A as part of their Form 1040. Schedule A is the form on which a taxpayer claims their itemized deductions and is probably the most common form attached to a Form 1040. This law increases the standard deduction (the base amount the IRS allows a taxpayer to deduct prior to figuring their tax liability) and eliminates or limits many of the itemized deductions that would show up on a Schedule A. What is the Difference Between the Standard Deduction and Itemized Deductions in the New Tax Law? A taxpayer is allowed to deduct the larger of the amount of itemized deductions or a standard deduction. Therefore, if more taxpayers use the standard deduction, which requires no additional form to fill out, and have less itemized deductions, there is less paperwork. This is the tax simplification this law seeks to achieve. How Does the Standard Deduction Change in 2018? The effect of these changes is to eliminate most taxpayers, except those with higher incomes, that itemize deductions because the standard deduction has almost doubled, meaning that it will almost always exceed the amount of itemized deductions. This is especially true because of the changes to itemized deductions. What are the Changes to Itemized Deductions? The changes to itemized deductions relate almost entirely to mortgage interest and state and local taxes. These are typically the highest dollar items that could cause itemized deductions to exceed the standard deduction. While limited, many taxpayers would not lose this deduction except for the fact that the increase in the standard deduction makes them irrelevant since combined they will most likely be less than that figure. State and local taxes are now capped at $10,000; anything above that amount is not deductible. Again, this cap will only affect high-income taxpayers. The vast majority of tax payers never get close to this amount. The deduction for mortgage interest is only allowed for residences with a mortgage that is less than $750.000 if acquired after December 31, 2017. This was $1,000,000 under the old law (and that amount remains if the debt was incurred prior to December 15, 2017). Mortgage interest on a second mortgage is still allowed, within those dollar limitations, but home equity interest is no longer deductible. Miscellaneous itemized deductions, such as unreimbursed employee business expenses, tax preparation fees, and safe deposit box fees, among others, which were limited in their deductibility under the old law to begin with, are now completely eliminated. Medical expenses have always been limited in their deductibility to the point where only very large amounts were allowed. 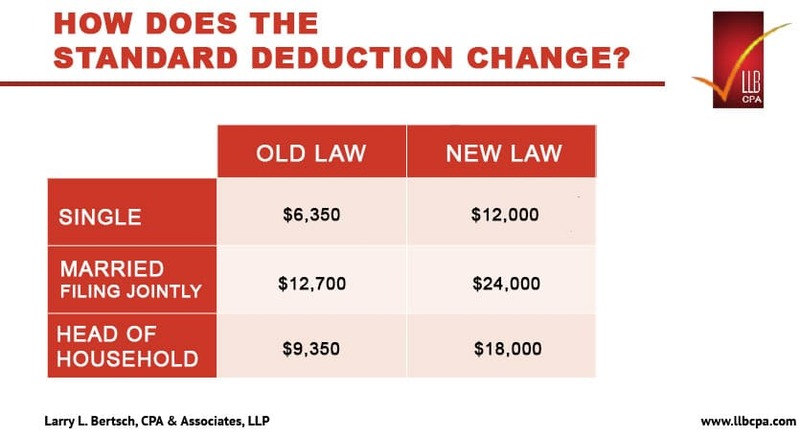 The limitation under the new law is less severe, but again, the large increase in the standard deduction effectively makes this deduction available only to those who have incurred catastrophic medical costs. The personal exemption ($4,050 in 2017) is eliminated under the new law. This was a deduction from income after taking either the standard deduction or itemized deductions. An attempt to offset this, at least for families, each of whom got the exemption if they qualified, is made under the new law by increasing the child tax credit. For most taxpayers, this reduces the benefit of an increased standard deduction. This was done solely to increase revenue to the federal government lost through other provisions of the new law, particularly due to a significant drop in the corporate tax rate. This is an example of tax tinkering. For those taxpayers who qualify for the child tax credit, the amount is increased from $1000 to $2,000 per qualifying child. This is a tax credit that reduces, on a dollar-for-dollar basis, the amount of tax owed. Though temporary this is a significant benefit. Student loan deductions and the America Opportunity Tax Credit for certain educational expenses remain the same under the new law. The deduction for alimony payments and their inclusion as income by the recipient are both eliminated under the new tax law, but not until January 1, 2019. The individual mandate under the Affordable Care Act is eliminated, meaning that there will no longer a penalty for not having health insurance. This does not take effect until 2019 so it is still applicable for 2017 and 2018. How Does the New Tax Law Affect Individual Filings? As stated before, it is important that you review your tax situation in light of these new laws. If you are an employee, you may want to consider filling out a new W-4 to make sure that your withholding is correct. If any provision of the new tax law may affect you but you are not sure how, consult with a competent professional such as a Certified Public Accountant or Enrolled Agent who can analyze your specific situation with regard to the new law.